« No wide angle? No problem! White backgrounds demand the most gear as you need to light the background and you need quite a bit of space to get them right. If you put your subject too close, you get a backwash off the background that destroys hair detail. I either aim a light at head height across a wall, or more often, I use a big softbox as a background – aimed back towards camera. The light reading *at the surface of the background* back towards the background light (this is into the soft box if you’re using a soft-box as a background) should be about 1 stop over the light on your subject. Put the subject about 8 feet in front of the background. Now – lighting the subject for corp head-shots on white, you don’t want anything too dramatic. Especially for women. The flatter the better. For the guys, a bit more shadow is good, so I tend to use one big soft-box off to one side, and put a side light in on the opposite side – another smaller soft-box, about 5 feet behind and off to the side. For Women, I tend to make a triangle from 2 soft-boxes, one huge and one strip box on the other side. The base of the triangle can either be a third soft-box, or a white reflector – horizontal and as far up as it will go without being in the shot. Now you can get close with just one speed-light, and a big white shoot through brolly – put the subject right up against a white wall and put the light right over them but a fair distance away. You need to back the light off to minimise the difference in distance from the light to both the subject and the background, so they both get more or less the same light. If the light is close, your subject will be getting much more light than the white background. You’ll expose the subject correctly and get an underexposed background. Ramp it up and add a reflector. It won’t be quite as good, and you will get soft shadows on the background, and the light on your subject will be harsher due to the increased distance from the light source but it works in a pinch. These Lencarta Smartflash II’s punch way above their price tag. Here’s a kit of 3 lights with 2 small soft-boxes. I’d recommend getting them to swap these out for 2 120cm Profold Octaboxes. These go up and down like a brolly – saves a lot of time if you have to setup and tear down the lights all the time. If you want the full Hurley effect – and for women a flatter light tends to look better, you will need more lights to create a triangle or square lighting setup, as in the pictures left and right. You’ll also need some form of boom to get the top light of your square rig up there. 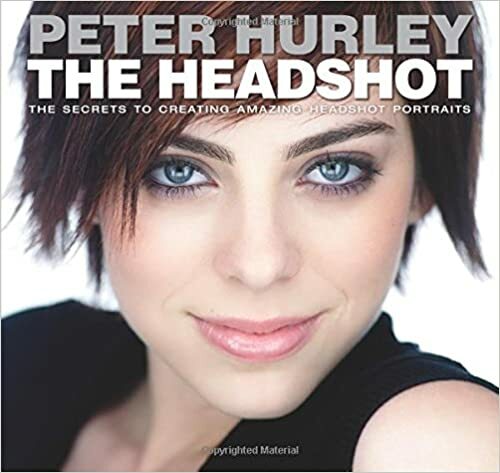 Peter Hurley uses banks of fluorescent strip lights for his work, however light sources of a size and distance, produce more or less the same light. There’s no magic crystals in the fluorescent lights that make better portraits. I prefer to use flash, as the constant lights tend to make the subject’s pupils contract and they end up with very small pupils which tend to give people a less engaging look. Put the camera about 5 to 8 feet in front of your subject. Contrary to popular myth, it’s not wide angle lenses that cause distortion in portraits – it’s a small shooting distance. The shooting distance is important. Too close and you will make closer parts of the face look much bigger than parts that are further back. This is because the difference in camera-object distance is much greater as a proportion than if the camera is a a long way off. i.e. if you are 1 foot away, a difference of 6 inches (say between tip of the nose and the ears) is 25 percent. At 8 feet away, it’s about 3% difference. Don’t go too far away though, or you’ll lose your emotional connection with your subject. The myth about focal lengths affecting the level of distortion is down to a correlation between shooting distance and focal length – i.e. if you shoot close, you need a wide angle to get all of the face it. Conversely, if you shoot from far away, you need a long lens to get the subject to fill the frame. Put the camera on a tripod. This will allow you to focus on the eye, and start shooting – either from behind the camera or standing next to it to connect with your subject. If it doesn’t move and neither do they, you can just keep pressing the button as the expressions start to flow. Fill the frame with face – by the time these images are in the corner of an email or LinkedIn page, they are tiny. If the face doesn’t take up the entire frame, it’ll be 3 pixels in the middle of the shot. Don’t be afraid to crop off the top of the head to make the face bigger.